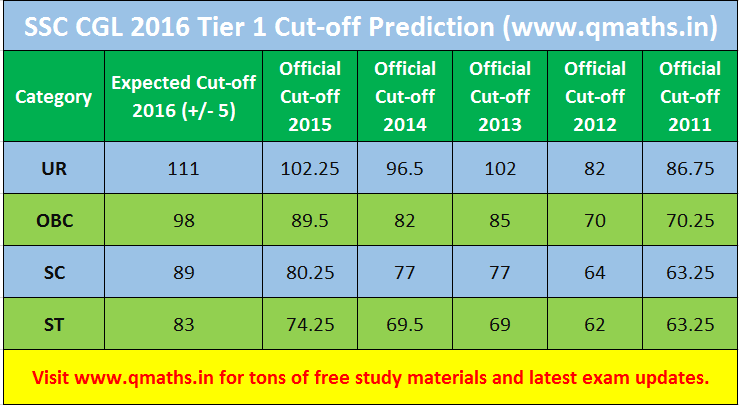 From past couple of days Team Qmaths has been continuously receiving lots of messages and mails regarding expected cut-off for SSC CGL 2016 Tier 1 (Prelims). 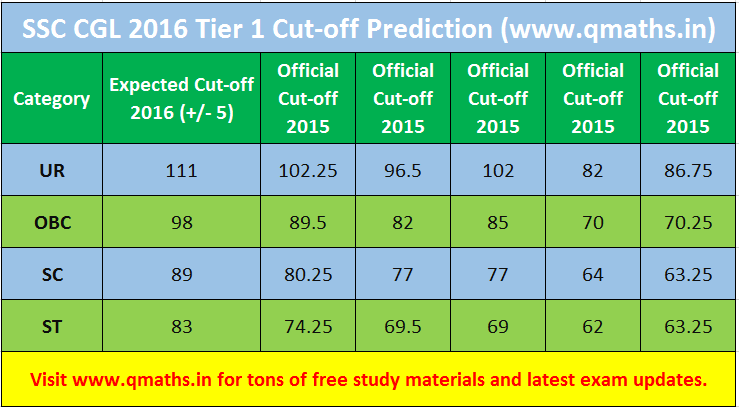 As you all understand that it is not possible to predict exact cut-off for SSC CGL tier 1 but on your kind request we have done some analysis and predicted SSC CGL 2016 Tier 1 Cut-off. 1) Reasoning : It was quite easy, and on same pattern as previous year questions. Aspirants did not feel any difficulty and on an average candidates have solved 22+ questions in this section. 2) Quantative Aptitude (Maths): This was considered to be a deciding factor in previous CGL exams. This time this section was too easy and every sincere aspirants may have solved 20+. 3) General Awareness: This section was of moderate level and will be a deciding factor. 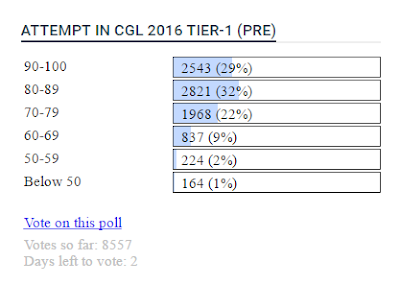 If one is good at GA and solved this section with high accuracy then it will definitely give him/her an edge over others in mains (Tier II). Good attempt is 15+. 4) English Comprehension: This was of moderate but higher difficulty level as compared to previous year SSC English question. An attempt of 20 + with high accuracy will be considered good. 1) This year SSC Deliberately introduced 75 minutes paper with easy to moderate level questions, as it was first time that SSC was introducing Online Test for SSC CGL Exam. There was server lags at many centers. Some questions were not properly visible for few aspirants. 3) SSC CGL-16 Tier 1 exam was worth of 50 minutes only, (Excluding bubbling time + Thumb impression , signature formality). SSC aspirants are well capable of completing whole tier 1 paper of 100 questions in 50 minutes time. 4) This time most of the aspirants completed whole paper 15-20 min earlier than allotted time. 5) Next thing on their mind was what should we do now, lets check un-attempted or mark for review questions. (Mostly from GA and English Section with uncertainty). 5) There was dilemma whether to attempt them or not but abundance of time lured them into attempting such questions in which candidates were not sure. And that's why almost everyone has attempted 90+, 80+, 70+ etc. It is evident from the poll more than 61% have attempted more than 80 questions. 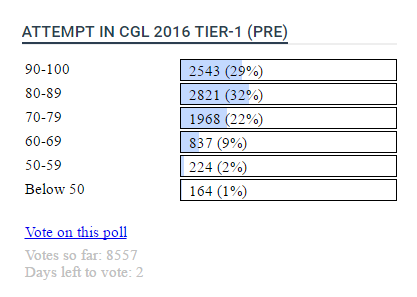 1) First and most important thing is Tier 1 Cut-off doesn't depend on No. of Vacancy of SSC. As its very early stage of vacancy. Final vacancy will be out after tier 2. 2) Approx 1.3 to 1.5 lac candidates will be qualified for mains (Tier 2). 3) Cheaters were restricted this time. 4) There were several issues of server lags and glitches. You may share your views in comments. 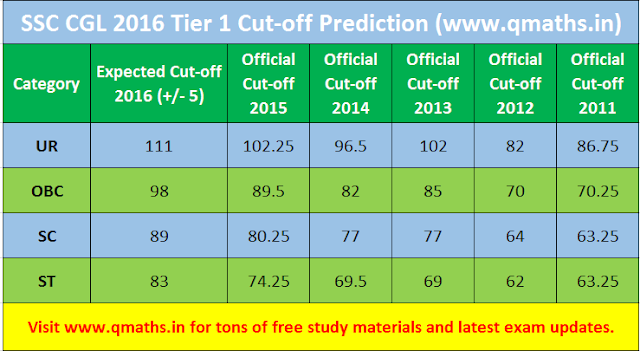 Disclaimer: This cutoff is expected and based on the feedback received from the aspirants. Final cutoff will be decided by SSC and will be a surprise.